This is a really tasty recipe I found online a few weeks ago, and it’s perfect for breakfast or brunch. 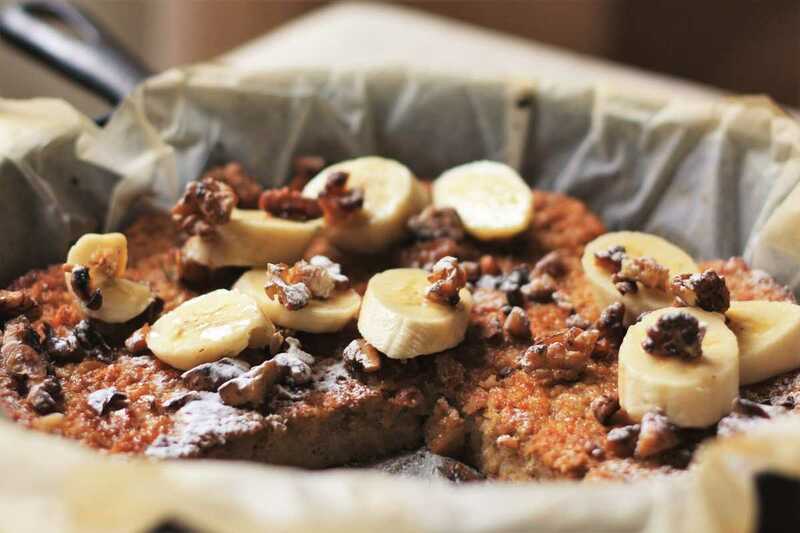 Two of breakfast’s long-time favourites, banana and oats, come together here to make a sort of flapjack. Because of the addition of milk and eggs, the texture is more like that of a coarse, oaty cake rather than a flapjack, which I thought was very good. Serve a generous wedge of it with your coffee in the morning for a breakfast of champions! Heat the oven to 180C. Mix the oats, caster sugar, baking powder, cinnamon, nutmeg and salt in a large mixing bowl. Melt the butter in a small pan. In another bowl, mash two of the bananas until almost smooth, then whisk in the milk, egg and vanilla extract. Whisk in the melted butter, then pour over the dry ingredients and mix well. Line a baking tray measuring approx. 20 x 20 cm and pour in the mix. Bake in the oven for about 25 - 30 minutes, until the mixture is firm, with golden colour on top. While the cake is cooking, lay out the walnuts on another baking sheet and bake for about 5 minutes, until browned slightly. When the cake has cooled slightly, slice the remaining banana and arrange on top. Finally garnish with the toasted walnuts.